Why risk your neck in close-up, hand-to-hand combat, when you can deter or even vanquish enemies from a distance? With the Punisher 3-Piece Throwing Star Set, it's easy! 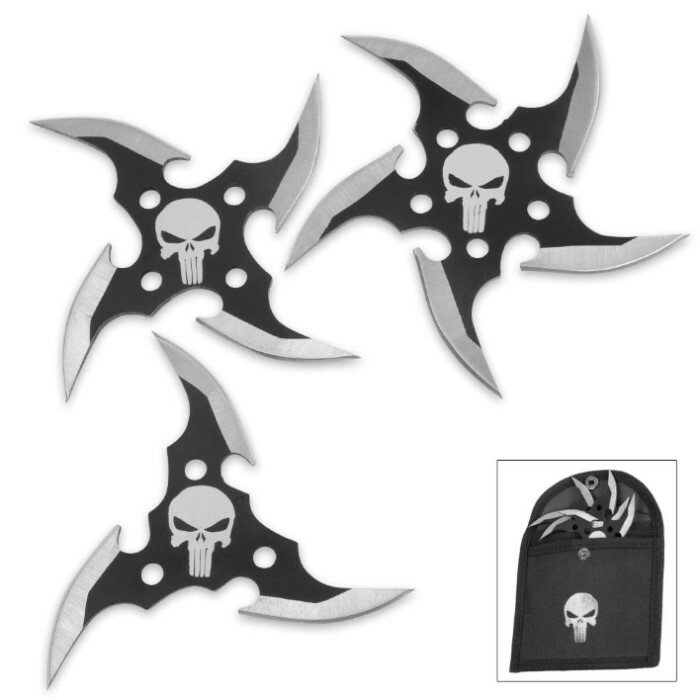 A deadly trio of sinister, razor sharp throwing stars, the Punisher set is essential gear for martial artists, blade enthusiasts, covert warriors, modern day ninjas or anyone seeking a potent hand-launched projectile weapon option. Each star features a unique array of 1 1/2" blades - three-, four- or five-blade - for maximum versatility in the field. Forged from tough, corrosion resistant stainless steel, all three stars boast ideal weight distribution, impeccable balance and sleek aerodynamics. At 3 1/2" in diameter, each is capable of inflicting serious damage, yet small enough to discreetly tuck away in the included black nylon pouch. 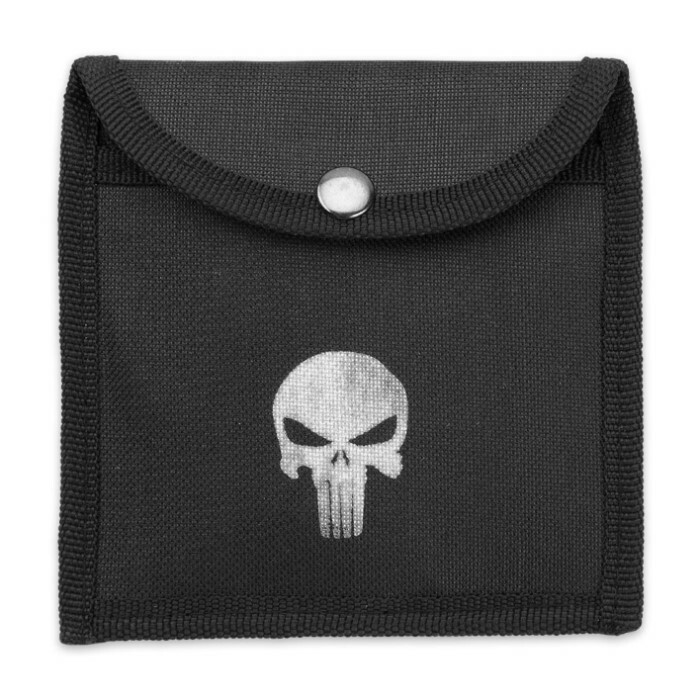 Beautifully designed and elegantly appointed, the Punisher set is also perfect for display - in a Far Eastern/ninja weapon collection, knife collection or on its on. Each star is finished in a nonreflective black with a chic white punisher skull etching. The raw, unfinished blade edges glitter and gleam with an otherworldly radiance as the stars spiral through the air. 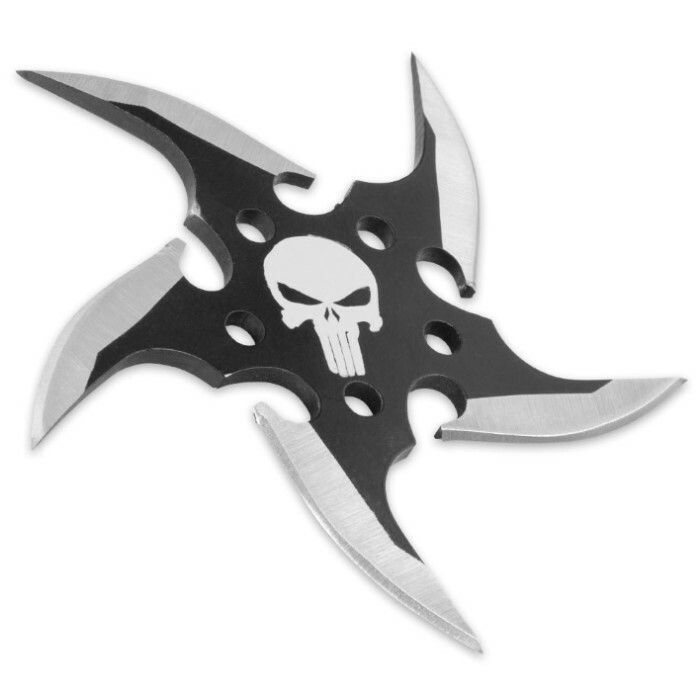 Regardless of how you decide to use it, rest assured the Punisher 3-Piece Throwing Star Set is built to last - through intense covert ninja operations, casual backyard target throwing and every scenario in between!